Misses' retro style dress with front, sleeve and neck variations. Misses' Learn to Sew pull on skirt with trim variations sewing pattern. 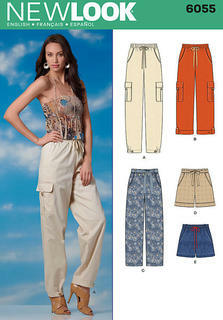 Misses' pull on pants with pockets and hem variations sewing pattern. Misses' jacket or vest, dress and pants sewing pattern. New Look easy Misses' dress, sash and bag sewing pattern. Misses' tunic or top with sleeve variations and tie belt. New Look easy sewing pattern. 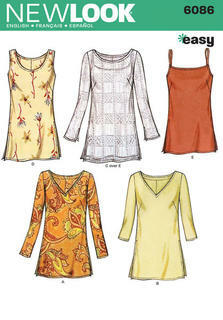 Misses' New Look sewing pattern tunic or top with front, sleeve and trim variations. New Look Sew New, Learning the Basics pattern. 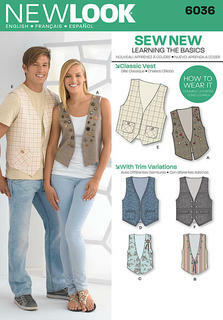 Misses' & men's vests with trim variations. 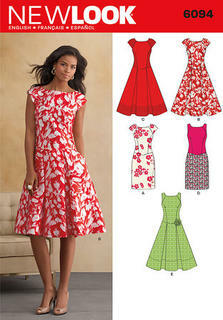 Misses' Design your look Dresses, New Look sewing pattern. Misses' skirts with length variations. Misses' jacket, dress or top, pants and clutch. Misses' dress with sleeveless or cap-sleeved bodice and slim or flared and pleated skirt. Workroom from Project Runway, misses' cuffed slim and flared shorts with tie belt. Misses' A-Line skirt in three lengths with pockets. Misses' button front blouse with sleeve and neckline variations and pencil skirt in two lengths. Misses' top, tunic with asymmetrical hemline and sleeve variations and easy pull on pants. New Look Workroom from Project Runway, Misses' sundress in two lengths and belt. Misses' Knit dress in maxi & knee length with neckline variations. Design Your Look with 4 bodice and 2 length options. Just for Knits New Look sewing pattern. Misses' sheath dress with peplum option, and sleeve and neckline variations. New look sewing pattern. 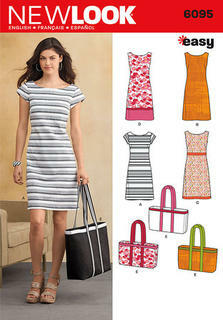 Misses' easy to sew A-line shift with pocket and trim variations. New Look sewing pattern. Misses' easy pull on skirt in four lengths with drawstring front and elastic back waist and optional pockets. Maxi length has deep side slit. 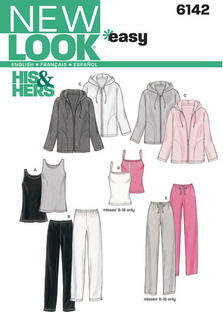 New Look sewing patterns.